During pregnancy one of the hardest things to do can be sleep and stay asleep. In the first trimester you are so tired but sometimes can't sleep. I totally blame all the extra hormones flying around your body. During the second trimester the hormones tend to level out a little but then your bump starts growing which can take a lot of getting used to. Then the third trimester comes and you get huge and so uncomfortable. With my two previous pregnancies I've found a pregnancy pillow an essential. This time is no different. I was sent the DreamGenii pregnancy pillow to test out and so far I am loving it. It has four main elements. The back support, central panel, bump support and the leg support. When you first look at the pillow it does look a little scary but it is so easy to use and so comfortable. In the second trimester I like to use a pregnancy pillow between my knees to help support my hips a little more. This pregnancy they have really started to ache a lot earlier than previously. 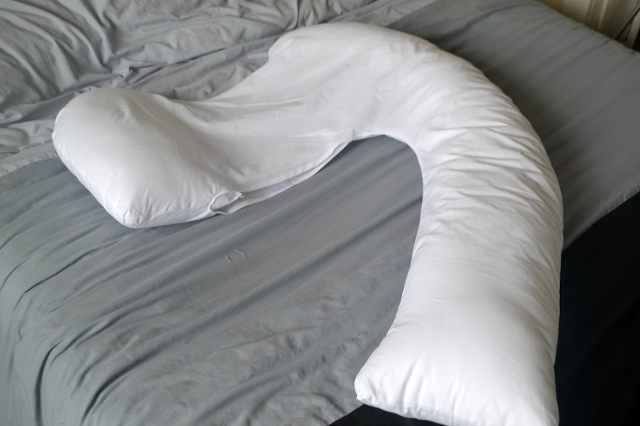 The DreamGenii pillow really helps to support my hips and legs while I sleep. My bump still isn't huge that I feel like I need the bump support cushion but it will be amazing in the third trimester. I am loving the back support. I think that's what sets this pillow apart from the previous ones I've used. It may only be a small pillow behind you but it really does work wonders for backache. Before I started using the pillow I was worried about the central panel. For some reason I thought it would be really uncomfortable but it isn't at all, in fact I don't really notice it underneath me while I sleep. The pillow is the perfect size in my eyes. It isn't huge that it takes up marks side of the bed as well as mine but it's big enough to support me and my growing bump. Something else I love about the Dreamgenii is that you can buy different covers. Its nice to be able to have different options. The pillow would make a lovely gift for that special pregnant lady in your life or yourself. Sleep really is so important and comfort is a huge thing in pregnancy. It may only be 9 months of your life but a pregnancy pillow is a great buy and can be kept for future pregnancies. Did you use a pregnancy pillow during pregnancy?